Music and dance from Central America and Caribbean, extending from Panama, separated only by its border with Colombia, Panama's costal tri-cultural people developed Cumbiaalongside their counterparts to the south. Cumbia has a distinctly indigenous influence from African culture. Bringing the best of Poe's poetry alive with the art of Dance! For more details about school shows or group rates please call or email. It's our last performance and you don't want to miss it A wonderful way to start the new year! Please come join us! Our beautiful and festive production of The Legend of the Poinsettia. Based on the Mexican legend of a pure hearted young girl who discovers the true spirit of giving. Unable to offer a gift of material value, she picks a handful of weeds that magically transform into brilliant crimson flowers and thus the custom of giving poinsettias during the holidays is born. A wonderful way to start the new year! Please come join us! This show is a great opportunity for students to learn and experience our beautiful and festive production of The Legend of the Poinsettia. Based on the Mexican legend of a pure hearted young girl who discovers the true spirit of giving. El Dia De Los Muertos is a Mexican holiday that brings communities together to remember and celebrate loved ones who have passed. Latin Ballet will be in New York City to perform! NuYoRican, a moving production in collaboration with award-winning journalist, Julia Torres Barden, author of "NewyoricanGirl...Surviving my Spanglish Life". “NuYoRican Girl” is a passionate tribute to the Puerto Rican Diaspora community who share similar stories of their migration to the United States. Watching my ancestors’ come back alive on stage was a riveting experience. Words cannot express how honored I am to be collaborating with the spectacular Latin Ballet of Virginia on this inspiring portrayal of mi gente. My heart brims with Boricua pride every single time I see this show.” Julia Torres Barden, author of “NEWYORICANGIRL…Surviving my Spanglish Life." NuYoRican, portrays the true stories of thousands of migrants to the United States and their triumph as they faced discrimination, assimilation, and political stigma upon their arrival after World War II. We would LOVE your Support! Please click on link below for more information. We are excited to be returning the RoseFest again this year! This is always a great event at the magical Lewis Gitner Botantical Gardens. We are happy to celebrate National Hispanic month with our friends at The Children's Museum of Virginia. Victor, The True Spirit of LOVE! The Latin Ballet of Virginia is proud to the premier of its new original work, VICTOR, based on the autobiography Son of Evil Street, inspired by the true story of Victor Torres, a teen from Puerto Rico who's forced to survive the "dark streets" of Brooklyn, New York, in 1962. VICTOR, The True Spirit of LOVE, tells the story of young gang member named Victor Torres from New York whose life was changed by the love and faith of his mother. Based in Victor Torres’ real life, VICTOR is an example of perseverance, faith and true love for everyone. In the early 1960s, Victor Torres and his family moved to Brooklyn, New York from their native Puerto Rico in search of a new life. The American dream quickly fades as they fell lost in their new country. As a new recruit in a street gang, a teenage Victor embarks on drug-trafficking business in an attempt to help his struggling family. Victor is quickly enslaved by drug use, and his parents, desperately search to find a way to save their son. A faith-based rehabilitation program is their last chance to rescue Victor. We are so honor to be able to create a performing arts interpretation of Victor’s life, but most important to have Victor Torres and his family guiding artistic director, Ana Ines King through this journey. Victor Torres lives in Richmond with his family, where they have established a rehabilitation center to help many people in desperation of recuperating from drug addiction, alcoholism, home less and families in need of a new life to come. Victor’s true story is much deeper and has made a lasting impact on the world today. We could not be more passionate about sharing this inspiring and true story that explores the power of faith to transform a life and the courage of a mother who never loses hope for her child. Latin Ballet of Virginia is excited to perform in this Opera alongside the Capitol Opera of Richmond and Jefferson Baroque. 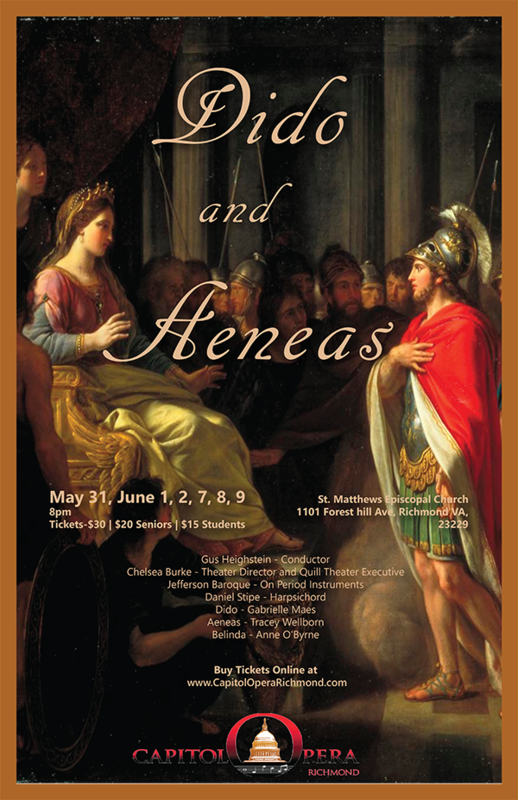 Dido and Aeneas is the only genuine opera by Henry Purcell (1659-1695) and is one of the earliest English operas. (“Genuine” in the sense that it is made up mostly of sung music rather than spoken word or dance interspersed with songs.) It was probably composed in 1688 for a performance at “Mr. Josiah Priest’s boarding-school at Chelsea by young gentlewomen.” See notes in the Bartlett edition’s introduction on the musical sources and theories of the work’s origin. The libretto, by Nahum Tate, is based closely on Book 4 of Vergil’s Aeneid. Tate’s main departure from Vergil’s epic was to add witches as agents of destiny. As in Vergil, the heroine is sometimes called Dido and sometimes Elissa or Eliza. In its musical style, the opera is very eclectic. It combines innovations from contemporary French and Italian operatic practice (a Lully-style overture, recitatives, laments over a ground bass), English country dances and Scottish rhythms, and even features from old-fashioned madrigals (the witches’ “ho-ho-ho”s are like fa-la-la’s in madrigals). JOIN US for RPAA's 2018 Gala, Alternate Routes: A Night in Havana featuring Jose Lorenzo & Timbason la Original, on May 19. Proceeds from this exciting evening benefit the artistic and educational programs of RPAA. Sponsorships include a “moveable feast” and live entertainment, featuring local artists and arts organizations, throughout the Dominion Energy Center venues prior to the concert as well as a post-concert dessert reception. Timbason takes its name from Son, the most influential form of Latin music in the late 1800s, and Timba, a Cuban version of America’s soul and funk. The newest and most provocative music out of Cuba, Timba is like salsa on steroids. It incorporates Brazilian music, R&B, hip-hop, Latin jazz, and Cuban salsa. Son, on the other hand, is a style of dance music that originated in the Oriente province of Cuba. It is the foundation of modern salsa. Timbason combines all of this in a unique hybrid of modern Cuban music that is more up-to-date and more in tune with the real music that Cubans listen to today. We are offering a number of Corporate Sponsorship levels, as well as Gala ticket packages and concert-only tickets. Contact info@rpaalliance.com or visit http://rpaalliance.com/2018RPAAGala for more information. Featuring Flamenco guitarist Leah Kruszewski, Award winning dancers and choreographers, Ana Ines King and Francisco Mesa "El Nano" and the Latin Ballet of Virginia professional dancers. Guitarist and VCU music alumna Leah Kruszewski currently resides in Seville, Spain, where she has spent the last four years deepening her knowledge of flamenco at the Fundación Cristina Heeren, one of Spain’s most renowned professional flamenco schools. While in Richmond, she founded the flamenco-inspired ensemble Sueños Gitanos and performed extensively as a soloist, with Fado Nosso (Portuguese fado music) and with the Richmond Guitar Quartet (classical guitar). Leah accompanies flamenco singers and dancers in Seville and teaches online guitar classes to students from around the world. From the passionate fury of flamenco to tango’s forbidden heat, the elegance of classical ballet to the earthen power of modern dance, the Latin Ballet of Virginia uses the expressive beauty of movement to weave the tales and traditions that are the heart and soul of Hispanic culture. Directed by Ana Ines King, The Latin Ballet of Virginia (LBV) combines technical excellence with a soulful depth of emotion and an unwavering commitment to education, diversity and accessibility. Due to the weather, The Center will be closing today at 5 pm. The Flamenco Master Class with Francisco Mesa "El Nano" will be moved to Thursday, March 22nd at 7 pm at The Dominion Arts Center, Downtown. Entrance from 7th Street security doors, between Broad and Grace Streets. Third Floor - Dance Studio. Por el tiempo, el Centro se cierra a las 5 pm hoy. La Clase maestra con Francisco Mesa, "El Nano" se dictara mañana en el Dominion Arts Center a las 7 pm. Entrada por 7th Street - Tercer piso. GRACIAS! Award winner dancer and choreographer from Valencia, Spain, studied in El Conservatory of Dance from Valencia, Spain. He started his professional career dancing as a soloist for the Ballet Español de Valencia. He has toured around the world with the renown flamenco company of Cristina Hoyos since 1996. Francisco has also performed with many renown flamenco choreographers such as Manolo Marin, Javier Latorre, Adrian Galia, Fernando Romero, Isabel Bayon and Mercedes Ruiz. He has danced as a soloist for The Ballet of Andalucía, the opera Carmen in Torino, Italy and in Broadway with the work of "Malaga in New York". He received in 1998 the award as first place on choreography of Spanish Dance and Flamenco in Madrid, Spain. Recently, he toured Japan for 6 months with his own choreographic work for El Tablao "El Flamenco". Francisco teaches and choreograph for several dance companies in Russia, Bélgica, Canada, Austria, Spain, Italy and the US.